Weather is very important. Even though we often complain about it, it is always a good topic for conversation if anything else fails at boring dinner parties or at the bus stop. And it is quite difficult to imagine a world without weather. This also goes for the world of Stella anatium. Although the weather in most duckumentaries from our Anatide parallel universe seems rather “neutral”, that is a mildly tempered one with a blue sky, rapid changes do occur, often causing significant disturbances in the events, sometimes even of catastrophic dimensions. 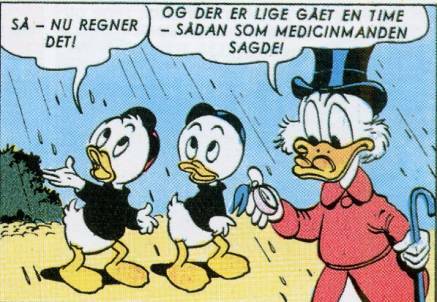 Naturally, the climate of Duckburg soon came on the agenda of Donaldistic scholars when the whole school took a scientific turn in the 1970s. 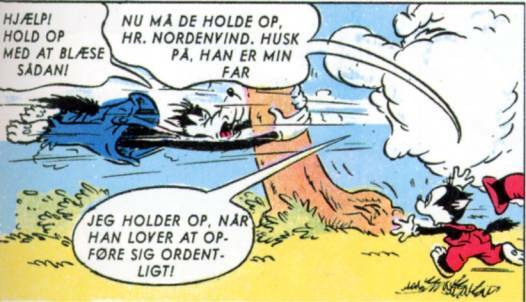 As in the case of many other essential Donaldistic study areas, the pioneers of Duckburg weather observations came from Norway. 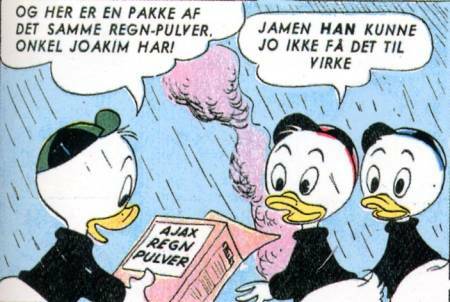 In the two very first issues of the highly recognized journal of Donaldism, Donaldisten, one of the early school’s leading scholars, Pål Jensen, accounted for several remarkable phenomena regarding the weather of Duckburg. 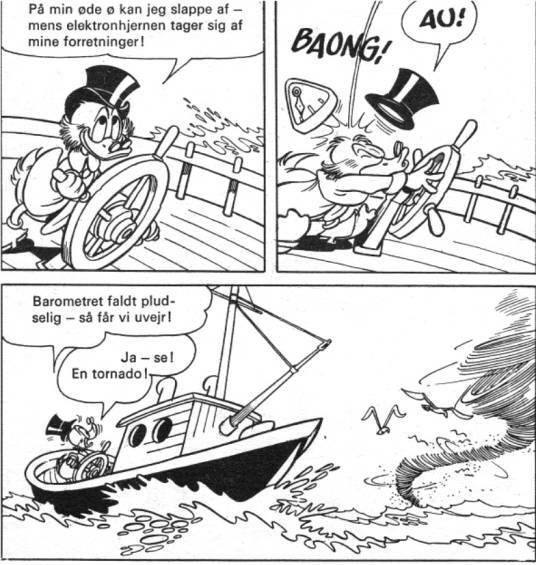 For instance, clouds are hardly ever seen on the sky over Duckburg (except around sunset and during actual storms), it is never calm during rain (rain drops always fall obliquely), and tornadoes occur relatively often. 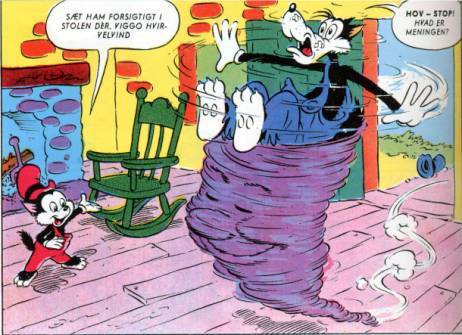 Jensen also pointed out that tornadoes and storms in general are more common in the vicinity of Duckburg than in the city itself. 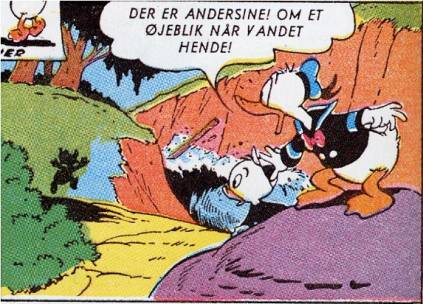 This he found to be in coherence with the Cosmos/Chaos-theory of his compatriot colleague, Jon Gisle, according to whom cosmos of Duckburg is constantly threatened by four types of chaos: 1. Witches; 2. Foreigners; 3. Criminals; and 4. Forces of Nature. 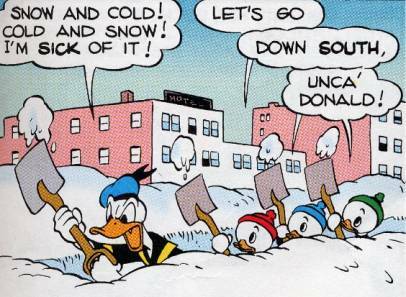 Duckburg climatology also took a central role right from the beginning of organized German Donaldism, as it became one of the four official initial research areas, when D.O.N.A.L.D. (Deutsche Organisation der Nichtkommerziellen Anhänger des Lauteren Donaldismus) was formally established in late October 1976. 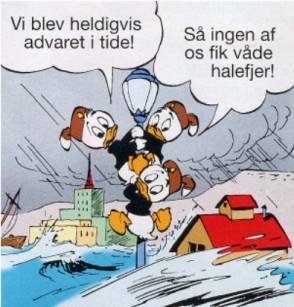 Some might say that this central inclusion of climatology partly had to do with the fact that the founding meeting took place in the home of meteorologist Hans von Storch, but that would be a complete misunderstanding: Duckburg climatology was of course only included because of its essential importance for Donaldistic research in general! 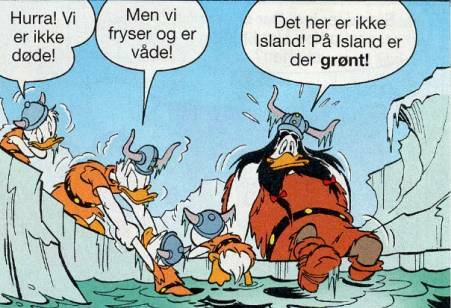 The important part of climatology for overall Donaldistic studies soon became evident, as Duckburg weather was one of the central elements of the first (and perhaps only) major scholarly dispute between Norwegian and German Donaldism, represented by its two leading figures, Pål Jensen and Hans von Storch. 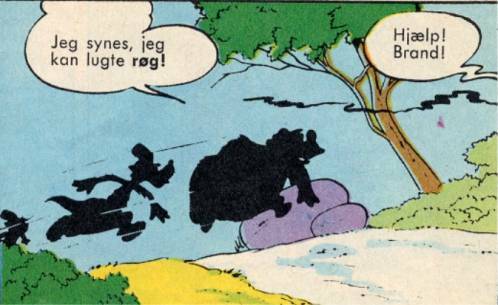 Meteorological observations from Barksistic duckumentaries were used to help identifying the geographical location of Duckburg on the North-American continent. I will refrain from referring the entire discussion here and just conclude that no consensus was reached. In short, it was debated whether weather (sorry!) conditions observed in the Donaldistic source material could fit with any of the suggested locations along the North-American coastline. 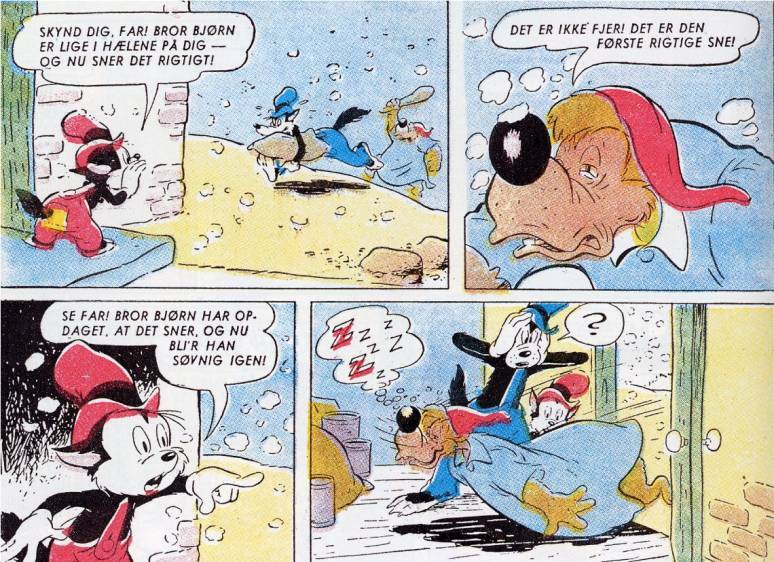 Here, von Storch found that the apparently rather harsh Duckburg winters were difficult to match with Jensen’s proposed locations of Duckburg in Southern California or along the Gulf of Mexico. This all very scientific discourse, which is a classic example of true Academic Donaldism, took place in 1977, but already the year after, a change of paradigm had made the whole discussion a bit superfluous, as scholars in the meantime had realized that Duckburg is not situated anywhere on our planet Earth, but should be looked for at a somewhat similar planet in a parallel universe; a planet, which scholars poetically named Stella anatium. Once again, climatological observations had paved the way to this essential recognition. 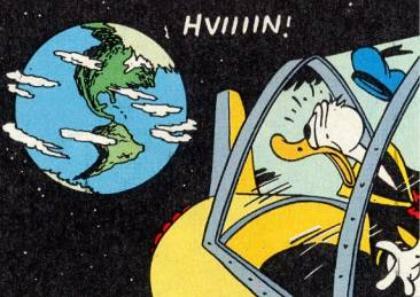 Using good old German virtues of thoroughness and scientific approach, Hans von Storch compared satellite pictures of Earth with pictures from space of the Duck planet, which led to the shocking but inevitable conclusion: The planets are not identical! 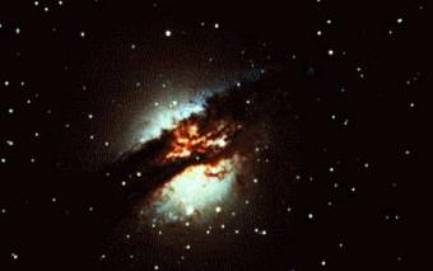 The formation of clouds known from Earth cannot be found around Stella anatium. 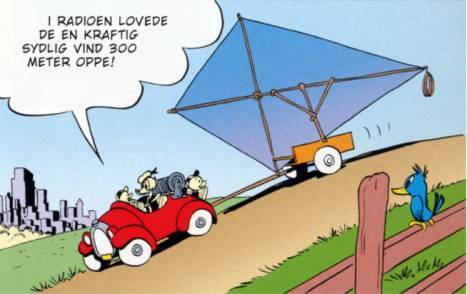 In addition to this, in the German version of the tale of the cold-sensitive frog Catapult (Da. : Badutski), Donald speaks of a “cold front breakdown”, which according to von Storch would be a down right ridiculous statement to make on Earth, where the correct meteorological term for the said weather phenomenon is “occlusion”. Von Storch realized that critics were inclined to put it against him that perhaps Donald was not altogether familiar with proper meteorological terminology and thus had fallen for the temptation of using a more layman-like term. Such a counter-argument was, however, rejected in advance by the German scholar as completely groundless, as Donald on numerous duckumented occasions has proven himself a very competent meteorologist. Therefore, the “cold front breakdown” had to be an actual, extra-terrestrial weather phenomenon. The ground-breaking recognition of Hans von Storch was presented in one of the still classical and basic works of our school, “Klima in Entenhausen”, published in the highly recognized Donaldistic journal Der Hamburger Donaldist vol. 13 (1978). 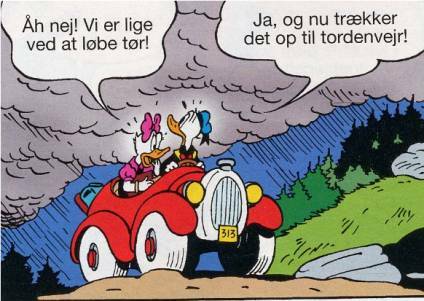 Another major result presented in this essential work was the realization that the second law of thermodynamics does not apply in Duckburg. A weather-related example of this is given by Mr. 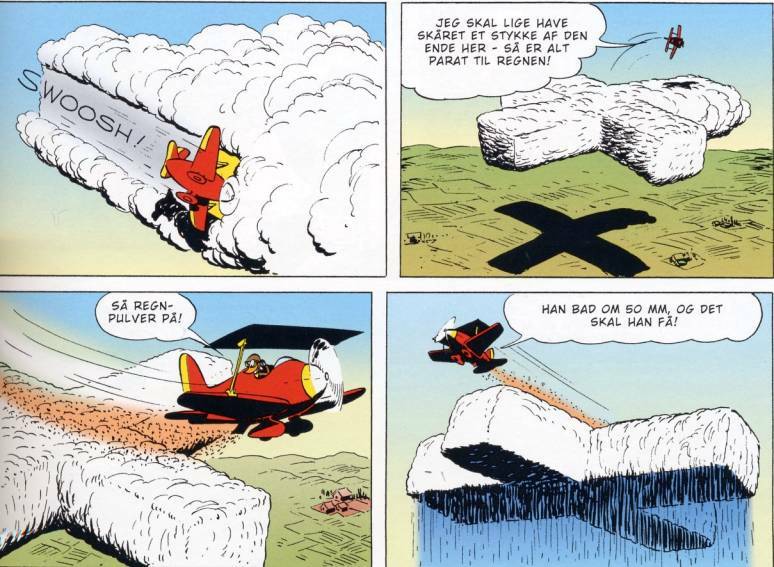 Duck himself, who during his occupation as flying rain-maker has a machine in his aircraft capable of creating snow storms in the middle of summer. Such a task demands an enormous amount of kinetic energy: »Daß er diese Bewegungsenergie nicht in seiner Thermoskanne mit sich führen kann, ist klar.« The only explanation left, according to von Storch, therefore had to be that Donald Duck’s machine can extract the energy necessary to cool down the air from the air itself. Something which cannot be done on Earth - probably not even in our universe. Having passed the school’s early attempts to compare weather in Duckburg with weather found in various North-American zones on Planet Earth, Donaldistic scholars are now back to studying Duckburg climatology on its own premises. And, so, how is weather in Duckburg? Well, as initially stated, usually quite good. 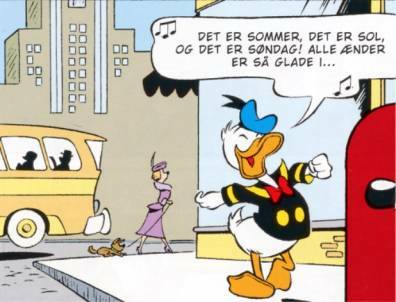 For someone like myself, living in the Southnordic region of Terra homines, it is hard not to look with some envy on the apparently vast majority of fine-weather days in Duckburg with blue sky, mild temperature (where you can walk around in a sailor shirt and no pants) and almost no wind. However, all this gentle peace and calm can suddenly change. A warning sign of such a change can be detected by the use of a barometer. 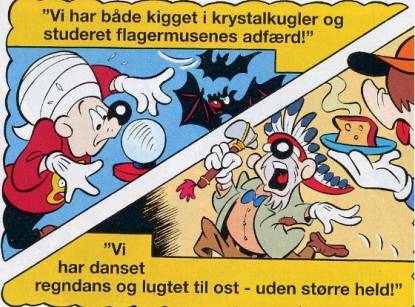 In spite of Donald’s sailor outfit, his somewhat ignorant response to the nephews’ observation (»The barometer has fallen, Uncle!« »Then pick it up! 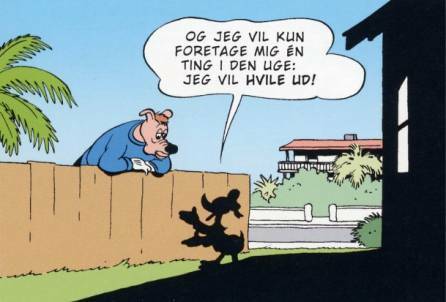 I’ve got other things to do!«) does leave some doubt about Dr. Hans von Storch’s abovementioned appraisal of Mr. Duck’s meteorological awareness. 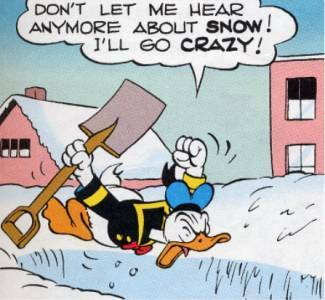 His (that is Mr. Duck’s) older and wiser relative, Uncle Scrooge, shows a significantly better insight to meteorological warnings. A sudden fall of the barometer means that a storm is ahead. 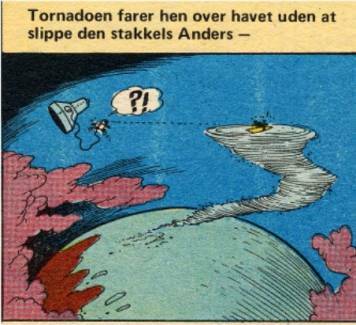 And storms on Duck Planet are often synonymous with tornadoes. 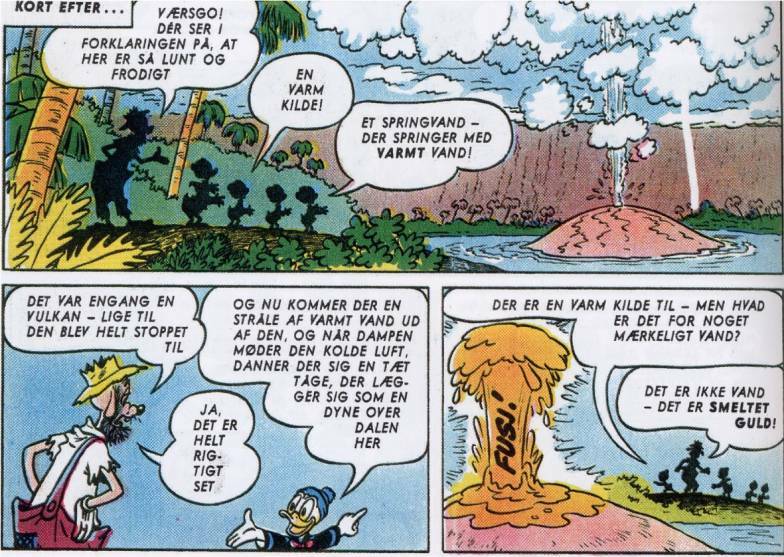 Tornadoes in and outside Duckburg can arise very suddenly and with an impressive power, even if only on a surprisingly local scale - and sometimes with an even more surprising accuracy in the caused effects. Tornadoes in Stella anatium occur in very different sizes. Some of them reaching far out into the atmosphere..
…while others are quite small. Moreover, wind and tornadoes in Stella anatium differ from the ones known on Earth by the fact that some of them actually “are alive”, that is, they have a mind, a face and the ability to speak! 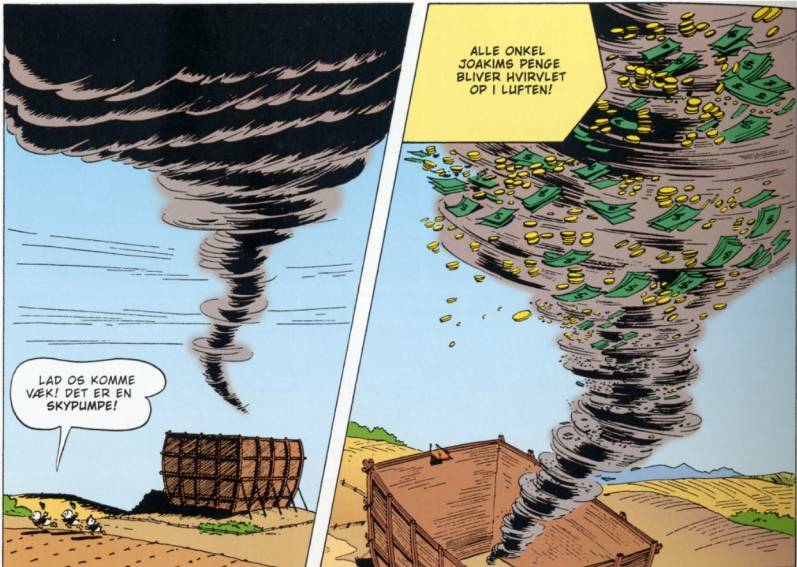 Finally, tornadoes are known to have produced vital changes in the basic economical structure of Duckburg - at least for a time. 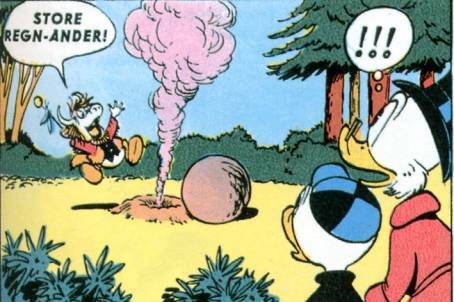 In fact, such a seemingly connection between large monetary quantities and air temperature, and thus wind movements, has been observed in Duckburg on more than one occasion. 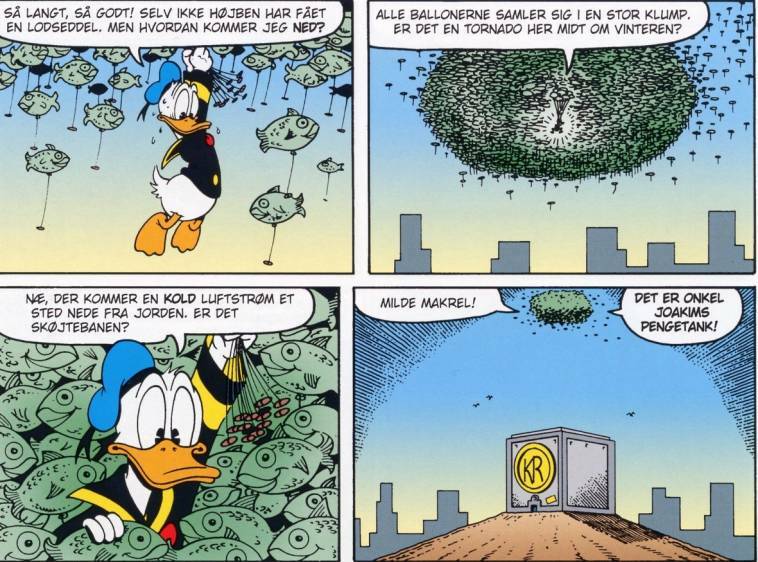 Too my knowledge, nothing similar has ever been seen around even the largest banks or gold deposits in our world, but then again, the monetary mass in Duckburg is exceptional. 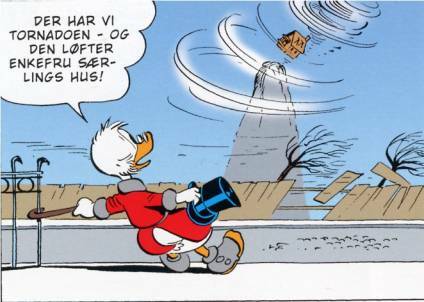 In spite of the sudden and apparently unpredictable behaviour of wind in Duckburg, the weather forecasts are impressively accurate. The forecasts presented in the radio even informs of wind speed in 300 metres altitude - an appreciated information for the city’s giant-kite flyers. 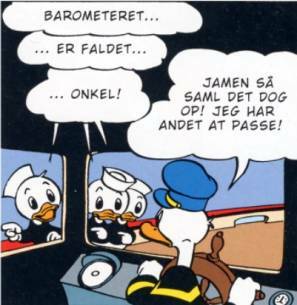 Such an accuracy appears even more impressive, when one takes a closer look on Duckburg’s meteorological profession’s professionalism. The forecasting methods apparently include scientific tools such as darts, crystal balls, bat-behaviour studies, rain-dancing and, of course, smelling of cheese. Not to mention licking the neck of a cat to determine the coming weather from its purring. Whatever can be said about the serious appearance of such methods, it cannot be denied that they seem to work. Therefore, taking into account the general accuracy of weather forecasts in our part of the world, these were perhaps methods worth suggesting to Southnordic meteorologists as well? 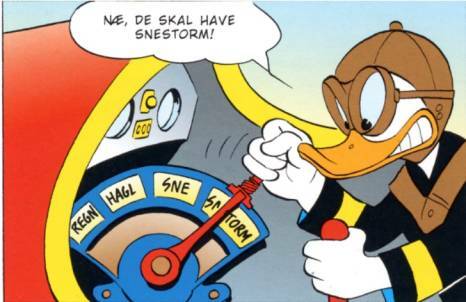 Even meteorologists of more alternative status in Duckburg can be strikingly precise and accurate in their predictions. However, in this particular case the successful weather forecast is based on more than just excellent foretelling skills (including rain-dancing and licking cats in the neck). 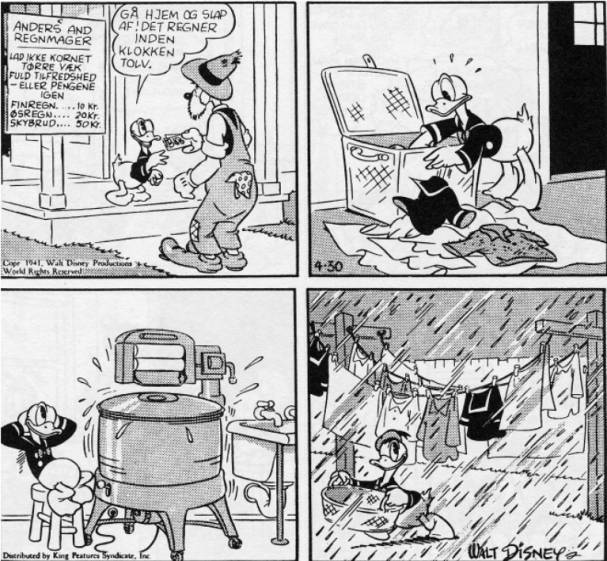 In Duckburg, meteorological experts are not limited to just predicting the weather - they can actually make weather! Especially rain-making is a wellknown practise among the Ducks, which can be performed both from the ground (above) and from the sky (below). Duckburg weather making is eased by a number of advanced chemical, physical and mechanical tools. In both abovementioned cases, the essential additional ingredient is rainpowder, which apparently is marketed in several registered brands, such as AJAX™ and M-3™. And for making snow, the true professional always has a sack of SNOWSTARTER™ ready at hand. ..or going on a picnic. The relatively rare rain in Duckburg could, at first hand, seem to lead to rather exaggerated panicking among the public, even at what otherwise appears only to be rather light showers. However, that would be a hasty and unjust misinterpretation, grossly underrating the meteorological understanding of the Duckburgians. In fact, the apparent “shower” over Picnic Wood, presented above, turns out to be a peripheral skirmish of a terrific cloudburst, which only seconds after causes a huge tidal wave and accompanying flooding. 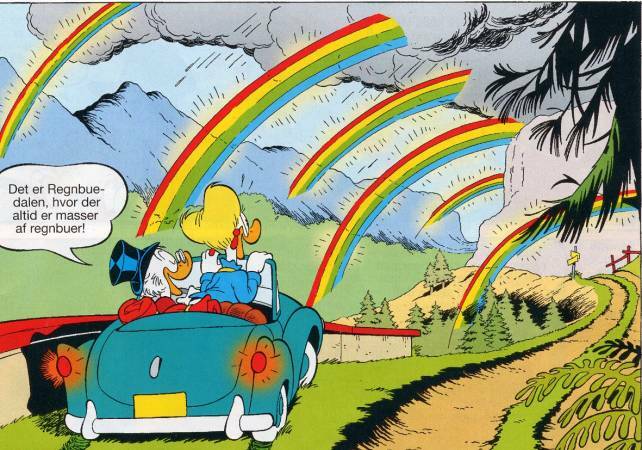 Thus, even short light showers are not something to be sneezed at in Duckburg and its vicinity. And neither are the well-founded warning cries of the Duckburgians. 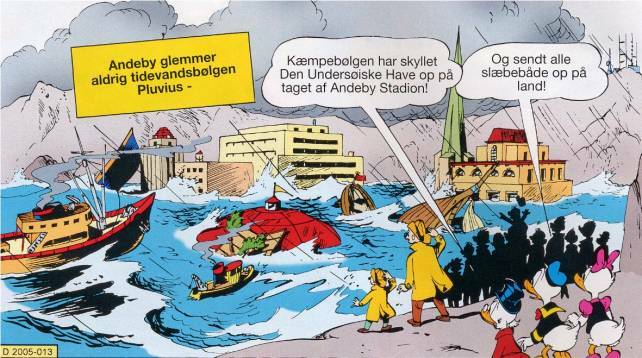 The major flooding threats against Duckburg do, however, not come from the rivers and the city’s hinterland, but from the seaside. 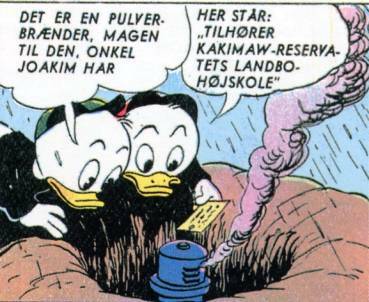 One of the greatest floodings in Duckburg’s recent history was named ‘Pluvius’. ..even if “warned just in time” apparently just means “warned early enough to climb up the nearest lamp post”. An evidence of the extreme size and force of this particular tidal wave is given in the fact that stranded whales subsequently could be found in the surrounding hills. Although picnics in general seem to have a rain-evoking effect when urban Duckburgians decide to visit the surrounding woodlands, the Wood normally appears to have an extremely dry micro climate. My esteemed colleague, Professor Jakobsen, dean of the Academy’s Faculty of Bearology, has found that it hardly ever rains at all in duckumentaries from the Wood. In spite of this lack of rain, the Wood mainly consists of deciduous trees - with smaller elements of conifer, which has a peculiar tendency to appear especially around christmas. Strangely enough, the dry climate never seems to threaten the Wood with drought - or drought-related fires, for that matter, although this may be due to the existence of a most alert corps of voluntary fire fighters. As a possible reason for the apparently favourable growing conditions in spite of the limited precipitation, Professor Jakobsen suggests a very high level of subsoil water. Precipition almost only occurs in the Wood during winter as snowfall. Among other things, the fall of snow serves as a very practical and important signal for the Bears to start the annual winter lair. In fact, even just a few snow flakes in the Wood are known to provoke an astounding hibernating response with the Bears. 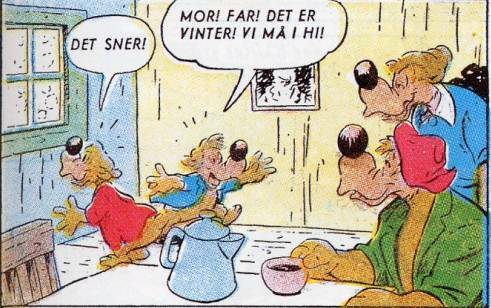 Therefore, according to Jakobsen, winters without snowfall can be feared to have an utmost disturbing effect on the Bears’ sleeping pattern - with an equally negative effect on their spirits. 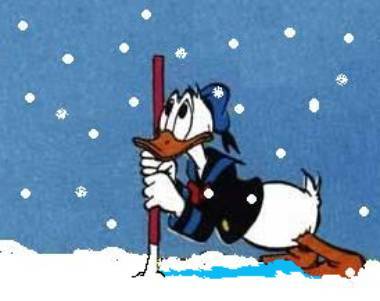 Fortunately, to judge from the duckumentaries, snow seems to be rather certain in the Woods from early December to late January. ..and impressive masses of snow. According to the elder generation, this is, however, nothing compared to the blizzards in their childhood. 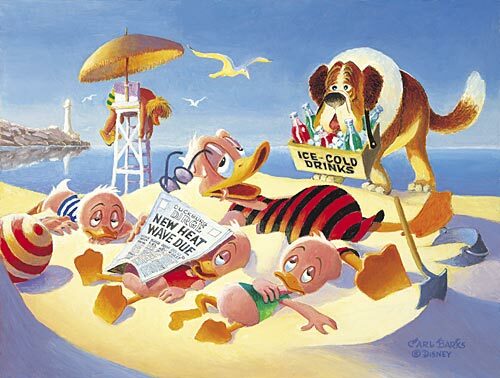 Conversely, Duckburg summers can produce shorter intervals with extreme heat. Whereas even the most extreme sides of Duckburg weather can be found on our planet as well, Stella anatium outside of its Anatide metropole has a number of quite unique and extra-terrestrial weather phenomena. Such as in Rainbow Valley, where several rainbows always occur simultaneously! A meteorological-optical phenomenon, which according to my inquiry with the Danish Meteorological Institute has never been recorded in Southnordic latitudes, at least not within the institute’s lifetime. ..some of them even in the shape of geysers spouting liquid gold. 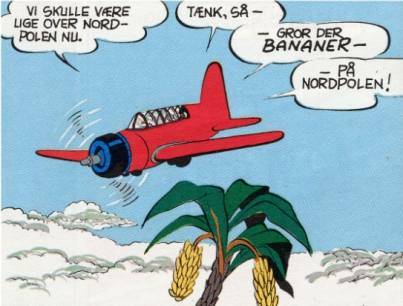 It is, however, still a matter of scholarly debate whether Mr. Duck’s claimed discovery of banana palm trees on the North Pole of Stella anatium is to be taken at face value, or if it rather says something about Mr. Duck’s aero-navigational qualifications. Climate changes in Stella anatium? 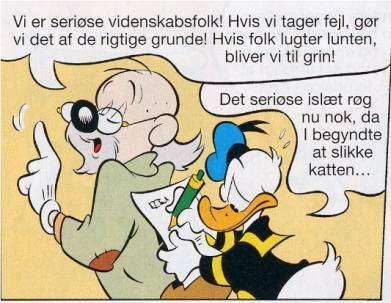 Now, as you all know, in these very minutes, where I share with you my limited knowledge on wind and weather in Duckburg and Stella anatium, a few kilometres away, the top climatologists of the world are meeting here in Copenhagen to discuss climate changes on Planet Earth. Which inevitable leads us to the obvious question: Is the climate (also?) 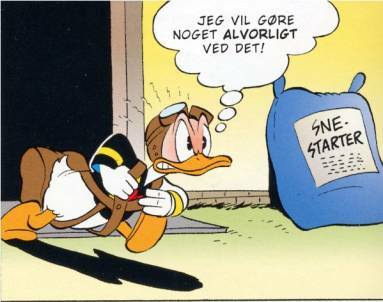 changing in Duckburg and Stella anatium? Well, according to Grandma Duck, as stated above, everything has grown softer since her childhood, including the winters. Serious scientists should, however, be careful not to put too much emphasis on such statements, as there seems to be a common tendency that old people everywhere and throughout times have claimed such a softness and laxity in present times compared to the good old days. A claim, which cannot always be confirmed by studies of more objective sources. 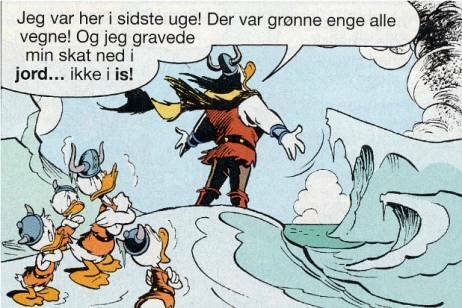 Actually, we have a completely opposing perception by a Duck Viking, who was defrosted in 2007, only to find that the world had grown significantly colder. Apparently, this would indicate that the climate has changed on Stella anatium within the 1000 years-span from the Viking Age till today. But how about climate changes on a shorter term? 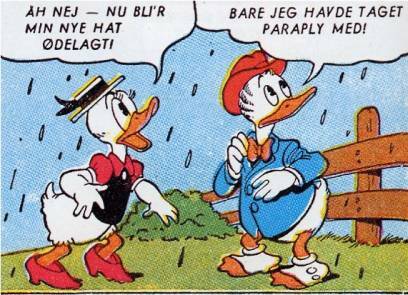 Have the weather in Duckburg changed systematically since we received the first duckumentaries from there in the late 1940s? One of our esteemed key note speakers here at the Duckburg Climate Conference of Copenhagen 2009, Professor Dr. John Thomas Airhead from the University of Calisota, has studied this important question thoroughly, and we are all very excited to learn about his findings shortly. 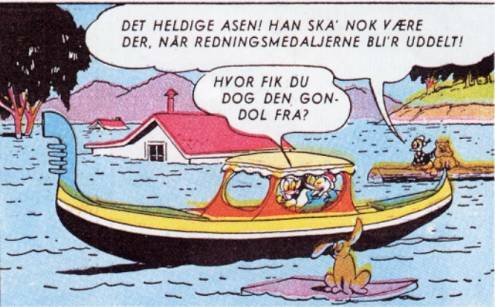 I will, however, close my modest contribution to this conference with the conclusion that weather and climatology certainly are worth studying, not least in Duckburg, where the quoted works of the early masters Jensen and von Storch hopefully will inspire a new generation of Donaldists for the future. 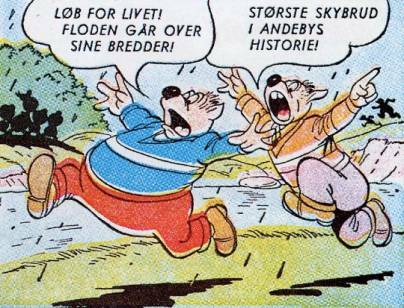 Furthermore, we can conclude that the old saying of the Danish philosopher Storm(sic!) 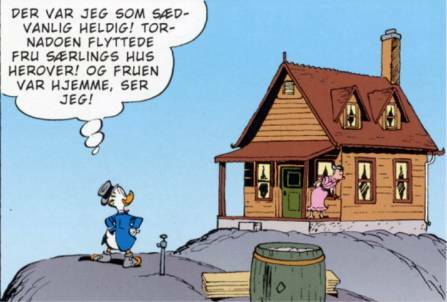 P. that “Everybody speaks about the weather, but no one does anything about it!” only applies for Earth - in Duckburg, they actually can do something about it. The four chosen research areas were: 1. The Veronkelung-system; 2. Socio-economical structures of society; 3. Aesthetics in Early Donaldism; and 4. 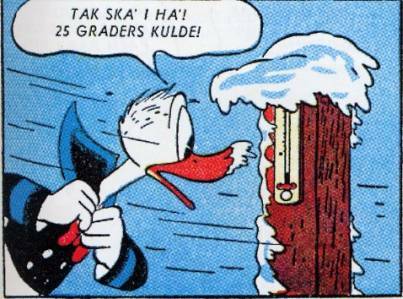 Climate in Duckburg. Der Hamburger Donaldist vol. 3, 1. The debate is reproduced in Der Hamburger Donaldist vol. 4, 19-20. 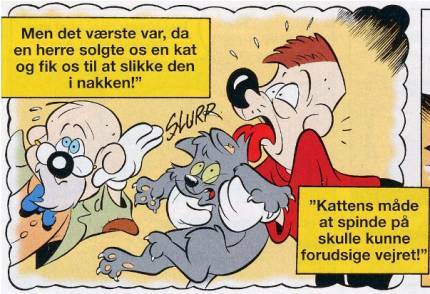 A Danish summary has been given by myself at an earlier occasion (Gjøgsig 2006). That is taking a tiny and apparently insignificant Donaldistic detail and blowing it up to what could be termed “Academic-Donaldistic proportions”, studying it from a most scientific approach and then have a long and pugnacious discussion about it with fellow scholars, which in the end leads to greater uncertainty than existed to begin with. With the antropomorph North Wind as a possible exception. Gisle, Jon (1973): Donaldismen, Oslo. 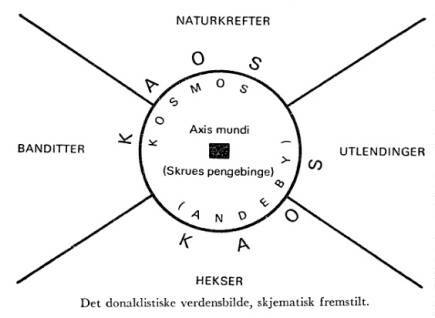 Gjøgsig, Jeronimus (2006): Klima i Andeby - og Stella anatium, Sydnordisk Akademi for Donaldisme. GrandjeAnd, Jacobinus (2004): Supplerende andtropologiske bidrag om sortænderne på Stella anatium, Center for Klassisk Donaldisme, SAD. 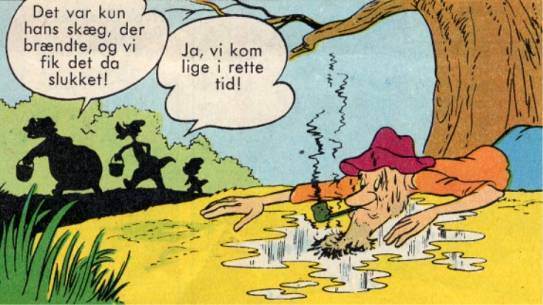 Jakobsen, J.G.G. (2006): Klimaforhold i Skoven (svar på seminarindlæg), Sydnordisk Akademi for Donaldisme. 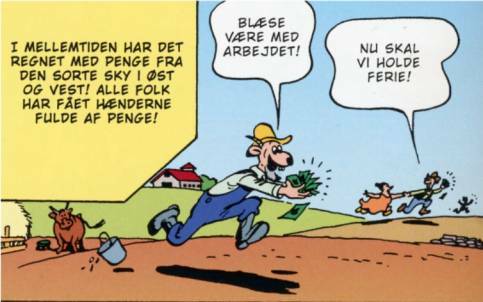 Jensen, Pål (1973-74): “Andebys klimatiske forhold”, articles in: Donaldisten vol. 1-2, 7-9 and 21-22 resp. Jensen, Pål, Uwe Schröder & Hans von Storch (1977): “Wo liegt Entenhausen”, in: Der Hamburger Donaldist vol. 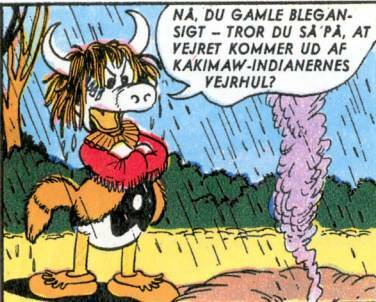 4, 19-20.
von Storch, Hans (1978): “Klima in Entenhausen - Physikalische Grundlagen”, in: Der Hamburger Donaldist vol. 13, 10-13.